Just Jessie B: Whole30 Shopping Guide: Trader Joe's! 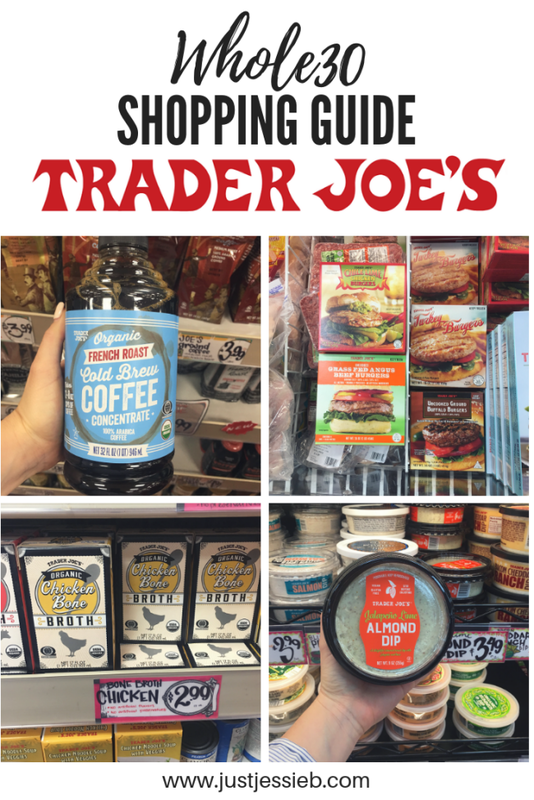 Whole30 Shopping Guide: Trader Joe's! This post has been on my to-do list for a long time. I love taking the guesswork out of shopping for you guys- especially during a Whole30, which is overwhelming enough! And while it's so, so important to learn to read your labels (for Whole30 and for life), I know there are those days when you just need to get in and out of the store and on with your day! Hope this list helps you fill your grocery list with some Whole30 compliant finds. Whether you're completing a round, or just looking for Paleo-friendly, healthy options- these are all squeaky clean and an excellent option to toss in your cart! For easy reference, I have many of these items saved in an Instagram highlight at instagram.com/justjessieb. However, this blog post is where I'll continue to update as I find new things to share! TO PRINT: find the "print" button located below my signature at the bottom of this post. You can choose to exclude things like my rambling up top, and photos too- super easy to print just the list of items to take along shopping! There are a few compliant bar options at Trader Joe's, best for emergency snacks to keep on hand and also for traveling. Watch out for sneaky sugars, peanuts, sweetened chocolate, and vanilla extract when it comes to these. (Note: vanilla bean is fine, but generally "extract"= alcohol based which is out for the program). Unsweetened chocolate is technically compliant but a "use with caution" situation since it gives major candy bar vibes. From dips to meats- there are SO MANY THINGS to cover in the deli section- and some awesome finds to make life easy! We love the almond dip for lunch or a snack with sliced peppers, cucumber, or baby carrots- and it's also awesome spread into a lettuce wrap! Try making my Slow Cooker Salsa Chicken with any of these compliant salsas, or layer them over a taco salad. Same goes for the guac! Awesome in a salad or on top of a Beef Fajita Burrito Bowl. There are two compliant sausage options at TJ's, and we love both for breakfasts AND for dinners! Check out my whole gallery of Whole30 recipes here on my blog and get inspired! Hot dogs are another favorite- we rely on them for easy weeknight dinners with some sautéed veggies (kale is our favorite with lots of garlic). For lunch wraps and quick protein pre- or post-workout, try the smoked salmon or sliced turkey breast! There are tons of options here in the frozen section- just look for single ingredient items as much as possible! I'm including some top favorites from the meat & veggie sections. See my Instagram highlight for some sneaky *not* compliant finds and why- hint: shredded potatoes!! If I'm not drinking water, you can find me sipping on organic coffee or mineral water. Love that there are some compliant options at Trader Joe's! Also keep your eye out for GT's Kombucha- one of the few compliant brands. We LOVE the Watermelon & Trilogy flavors in our "mocktails"! Mineral Waters: the TJ's brand is great, but Spindrift is our favorite! No "natural flavors"- just a small amount of fruit juice. That's all for now! I'll update this post over time as I find some new things that are blog post worthy :) Hope this helps!! Thank you for putting together this post Jessie. Very helpful. This is so great! Thanks for making my Whole 30 easier!